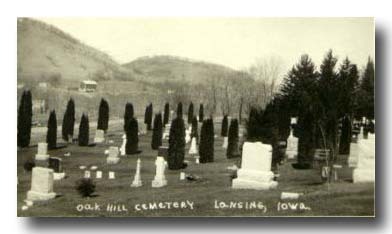 Although many of these records can be reached from other menus on the main index page, they have been grouped together here to assist the researcher to find the thousands of death & burial records contained in the pages of the Allamakee co. IAGenWeb website. In most cases, you will have to use your "BACK" button to return to this page. The Obituary Boards will open new windows. Allamakee county Death certificate index 1936-1939 - courtesy of the Iowa State Historical Society. State Level Death Certificate Index, ie: pre-1939 records that are not on county record microfilm. This index is not a transcription of the original records. The obit boards often update daily, check them often! Many Allamakee people may have been born in or lived in other counties. It is possible their obits are posted on neighboring county Obit boards. Be sure to check them all!